Recently the food and beverage industry in Mexico agreed on Code of Self-Regulation on the Advertising of Food and Beverages Directed at Children (Código de Autorregulación de Publicidad de Alimentos y Bebidas dirigida a Público Infantil – PABI). The code of conduct, signed by companies representing about 70% of advertising in Mexico in the sector and promoted by major industry groups, is due to take effect on 01 January 2009. It will be monitored by an advertising industry watchdog. At the formal signing ceremony for the new code, industry representatives declared that it represented a firm commitment by the food and beverage industry to utilize advertising to promote healthy lifestyles among children, while the Secretary of Health and the Office of Federal Prosecutor for Consumers (Profeco) praised it as an important step in fighting childhood obesity in Mexico. But is it really all that? 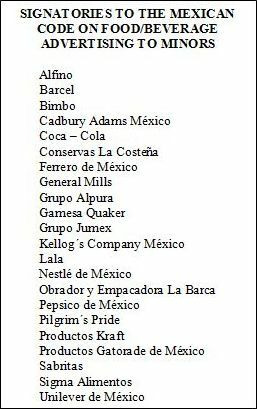 The Code signatories announced so far include the local subsidiaries of major multinationals, such as Coca-Cola, Pepsico, Nestle, Unilever, Kraft, Kellogs, General Mills, Quaker and Cadbury Adams and Mexico’s own Bimbo. Notable by their absence from this list: fast-food restaurant chain owners such as YUM! Brands (KFC, Pizza Hut), McDonald’s, Burger King and Wendy’s, candymakers Hershey and Mars, and dairy product giant Danone. These last two signed a similar code in Spain. Burger King, McDonald’s, Hershey and Mars all signed a voluntary code on this subject in the US. The trade associations backing the code include the Business Coordination Council (Consejo Coordinador Empresarial – CCE), the National Agriculture Council (Consejo Nacional Agropecuario – CNA), the Confederation of Industry Chambers of Mexico (Concamin), the National Chamber of the Transformation Industry (Cámara Nacional de la Industria de la Transformación – Canacintra), and the Mexican Council of the Consumer Products Industry (Consejo Mexicano de la Industria de Productos de Consumo – ConMéxico). Curiously absent from this second list: the National Association of Chocolate and Sweets Manufacturers (Asociación Nacional de Fabricantes de Chocolates, Dulces y Similares – Aschoco) and the National Association of Soft Drink and Carbonated Waters Producers (Asociación Nacional de Productores de Refrescos y Aguas Carbonatadas – Anprac). Yes, I know that they are members of Concamin and thus technically are represented here, but it is interesting that they did not choose to signal individually their commitment to the Code. What prompted this action by major players? Did these companies just look around on their own, decide that there is a problem with the way their products are marketed to Mexican children, and elect to self-police themselves? They might hope you think so. Not quite. In the late 1980s, after the adoption of the World Health Organization (WHO) Infant Formula Code, the FAO Pesticide Code of Conduct, the launch of Health Action International’s (HAI) pharmaceuticals campaigns and the formation of an anti-tobacco NGO coalition to push for WHO action on tobacco control, several of the larger players in the food and beverage industry were warned privately that it was only a matter of time before they would be targeted too. They were also told that when the international initiative finally came, it would probably focus on sweets, snacks and/or “junk” (high-sugar and/or high-salt and/or high-calorie and/or high-fat foods), with an initial emphasis on marketing to children. It didn’t happen right away, for reasons too involved to get into here (such as disagreements among NGOs about campaign priorities, lack of WHO leadership support to take on the food industry at that time, etc.). But instead of taking advantage of that breathing room and being proactive, many of these companies ignored the warning. Conditions have changed in recent years. The movement in the US to get certain foods out of schools, epitomized by the formation of the Alliance for a Healthier Generation in 2005 by the Clinton Foundation and American Heart Association (AHA), has spread to other nations, including several in Latin America (here, here, here, here, here and here). Spain and the US have adopted voluntary code on selling foods and beverages to children, and Canada has added interpretation guidelines regarding food to its Broadcast Code for Advertising to Children. In 2006 WHO convened a technical meeting on the marketing of food and non-alcoholic beverages to children and in 2007 the Pan American Health Organization (PAHO) launched an initiative against trans-fats. 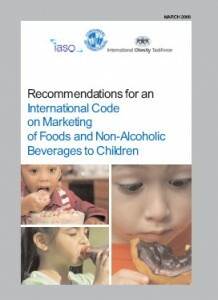 This past spring Consumers International (CI) and its allies proposed to WHO a draft International Code on Marketing of Food and Non-Alcoholic Beverages to Children (English; Spanish). Last but not least, Mexico City just passed a law on obesity, bills on obesity, fatty foods and metabolic syndrome have been submitted in the Mexican Congress in recent months (here, here and here), Mexican consumer groups have called for legislation restricting food/beverage advertising to children and pressuring the Education Secretary not to allow the sale of “junk” food in Mexican schools, and Profeco and the Health Secretariat have been hinting at using existing regulatory authority under Mexico’s Consumer and Health Laws to restrict ads. All these initiatives, national and global, have been fueled primarily by rising concern among health officials and advocates everywhere about a growing obesity, diabetes and cardiovascular disease problem, particularly obesity among children. In Mexico, for example, the Health Secretariat says that obesity has grown in the last seven years among children under five years old from 6.1% to 7.5%, while among those 5-12 it has risen 40% to affect 4.2 million Mexican kids. The Secretariat also says that the average Mexican child aged 4-12 watches an average 12.5 hours of television a week and sees an average of 61 ads, 42% of these about food, and of those, 39% are for candy, 12% for fried food, 9% for sugary drinks, 8% for cookies (“biscuits” as my British friends call them) and 7% for pastries. So the industry has been reading the “writing on the wall” and decided to act before having something imposed on them. This initiative is intended to avoid or at least stave off any binding measure, whether legislature or regulatory within Mexico, or international in the WHO context. My only surprise is that the voluntary initiative occurred in Latin America first in Mexico. I suspect that it will not be the last voluntary code in the region on this subject. Although it claims several references, Mexico’s PABI Code clearly is modeled mostly after Spain’s Code of Self-Regulation on Advertising of Food and Beverages Directed at Minors (Código de Autorregulación de la Publicidad de Alimentos y Bebidas dirigida a Menores – PAOS). The substantive guts of the PABI Code are the 30 articles in the General Criteria and the seven Action Principles in Annex I. Much of the General Criteria are frankly standard fare — ads should not be deceptive, incite violence, use stereotypes, makes claims not permitted under law — that companies are obligated already to follow under existing Mexican consumer and health law. The PABI Code makes several references to food and drink ads respecting and supporting a “healthy diet,” “healthy eating” and even once to “healthy body weight,” but it’s fuzzy on what these terms mean. Article 13 is more concrete: it says that advertising should stick to the dictates of Official Mexican Norm (NOM) 043-SSA2-2005. But then, NOMs are supposed to be binding anyway, so they don’t need a voluntary code of conduct to ensure their implementation and enforcement, do they? 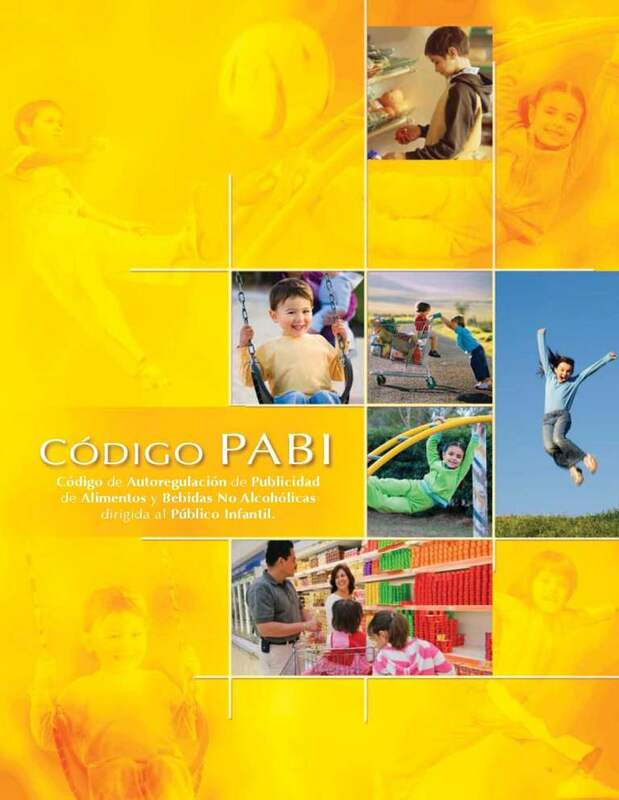 The PABI Code’s implementation is monitored and “enforced” by the private-sector Council of Advertising Self-Regulation and Ethics (Consejo de Autoregulación y Ética Publicitaria – CONAR). But the Code does not have serious sanctions for violating it. Even public pressure does not come into play until a second violation is found, when CONAR can publicize the violation. Contrast this with the Spanish code (PAOS) on which Mexico used as a model: violators pay fines per violation, ranging from €6,000 to €180,000, depending on its severity. La iniciativa es promovida por las principales organizaciones del sector privado – CCE, CNA, Concamin, Canacintra y ConMéxico – con el objetivo de que cada día sean más las empresas las que se apeguen a los nuevos principios de una publicidad infantil de alimentos y bebidas no alcohólicas responsable. La Secretaría de Salud y la Procuraduría Federal del Consumidor (Profeco) atestiguan la firma del Código PABI, ratificando la importancia de la acción conjunta y coordinada de los sectores público y privado en la búsqueda e implementación de soluciones que contribuyan al mejoramiento de la salud de la población. 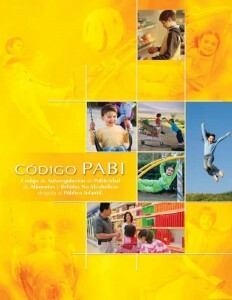 El Código PABI entrará en vigor el 1º de enero de 2009 y su vigilancia y ejecución estarán a cargo del Consejo de Autorregulación y Ética Publicitaria (Conar). Este lunes, la industria formal de alimentos y bebidas no alcohólicas se reunió para firmar el Código de Autorregulación de Publicidad de Alimentos y Bebidas dirigida a Público Infantil (PABI), contando con la presencia del Dr. José Ángel Córdova Villalobos, secretario de Salud, y del Lic. Antonio Morales de la Peña, procurador Federal del Consumidor, como testigos de honor. Asistieron, también, líderes de las industrias de la comunicación y publicitaria a escala nacional. La iniciativa promovida por las principales organizaciones del sector privado tiene por objetivo fomentar las mejores prácticas vigentes en la realización de una publicidad de alimentos y bebidas no alcohólicas socialmente responsable, que además vaya en línea con las recomendaciones de la Organización Mundial de la Salud establecidas en la Estrategia Mundial sobre Régimen Alimentario, Actividad Física y Salud. Empresas de alimentos y bebidas no alcohólicas, las cuales representan alrededor de 70% de la inversión publicitaria del sector, se están comprometiendo a realizar una publicidad responsable dirigida a niños, haciendo de ésta una herramienta para el fomento de una alimentación correcta y la práctica habitual de la actividad física, contribuyendo así al desarrollo de soluciones integrales para hacer frente al sobrepeso y la obesidad. Dada la problemática de salud pública que enfrentamos, hoy es prioridad que todas las partes involucradas, tanto del sector público como privado, trabajen coordinadamente en un objetivo común y actúen con responsabilidad compartida para afrontar este reto de salud pública. En este sentido, “el Código PABI es sólo el primer paso de acciones conjuntas futuras”, señaló Ismael Plascencia, presidente de Concamin. Por su parte, Mario Páez, presidente de ConMéxico, dijo que “la fuerza de la autorregulación reside en preservar la confianza del consumidor en la empresa, la cual busca fortalecer ante éste su reputación y la de sus marcas. Agregó, que “el compromiso de quienes firman el PABI es realizar publicidad infantil innovadora fomentando desde la niñez el cuidado de la salud, aprovechando, al máximo, la fuerza publicitaria del sector privado en la promoción de estilos de vida saludables”. El Código PABI es un instrumento de colaboración con las autoridades. Se llevarán a cabo evaluaciones periódicas cuatrimestrales, cuyos resultados serán compartidos con la Secretaría de Salud y la Profeco. Asimismo las evaluaciones son un mecanismo de actualización, pues de identificarse el empleo sistemático de una práctica publicitaria que pudiera ser contraria a los principios rectores, se convocará a una revisión integral del PABI. La autorregulación es, además, una herramienta que empodera al consumidor y pone a su disposición mecanismos ágiles y eficientes de resolución de posibles inconformidades, lo que lo convierte en un participante activo en la conformación de consumidores responsables. Cualquier consumidor, organización social o privada puede acudir al Conar a presentar una inconformidad. Un post muy interesante, estoy totalmente a favor de la autoregulación. Gracias por la información. Un saludo.